December 4, 2009, By Grace Gagliano, BradentonHerald.com, Manatee — Florida voters were clear in November 2008 when they overwhelmingly approved Amendment 6. Now, one month from when the tax break for working waterfront property is to be implemented, legislators and property appraisers are in the dark about how to assess such properties. The constitutional amendment, which passed with 71 percent of the vote, said working waterfront property would be assessed on its current use starting Jan. 1. Currently, waterfront property is taxed on its current and best use, usually a higher tax rate. But the Florida Senate and House of Representatives couldn’t agree on how to determine the current use value of qualifying properties. The Legislature will take that issue up again in March, meaning property appraisers won’t know what the tax breaks are for owners of commercial fisheries, marinas, dry stacks and marine manufacturing facilities until July. Properties must file for a working waterfront classification with the property appraiser before March 1. The classification is given to those properties that are dependent on the water for their business. “We’re supposed to implement something for which there’s no law that tells us how to do it,” said Charles Hackney, property appraiser for Manatee County. Bob Gertz, owner of Parrot Cove Marina in Palmetto, said he is disappointed he will have to wait longer to see what his property tax savings will be under Amendment 6. Karen Bell, owner of A.P. Bell Fish Co. in Cortez, also said the sooner business owners can find out their tax break the better. The Senate and House this year had two different plans on how to determine current use value of working waterfront properties. The Senate detailed a specific formula for property appraisers to follow, while the House opted to rely on the property appraiser’s professional judgment to assess its current use value. Both the Senate and House’s bill died in the session. Calls to Sen. Mike Bennett and Rep. Ron Reagan were not returned Thursday. Keyna Cory, chief lobbyist for the Associated Industries of Florida, said the Senate and House each felt the other’s method wouldn’t properly calculate the current use value. “This legislative session property appraisers will get a clear method of how to appraise these properties,” Cory said. For the 2010 legislative session, there is an identical bill in both the House and Senate addressing working waterfront property. The bill states “the assessed value shall be calculated using the income approach to value, and using a capitalization rate based upon the debt coverage ratio formula.” But if that method isn’t appropriate, the bill states the property appraiser will take into consideration the condition, present market value and income generated at the property to determine a value. THURSDAY, NOV. 19, 2009 LEAGUE OF CITIES LEGISLATIVE CONFERENCE: The League of Cities will meet Thursday and Friday in Orlando to set out legislative policies and priorities for the upcoming session. Florida League of Cities President John Marks, mayor of the City of Tallahassee, will preside over the conference. A discussion on energy moderated by Tavares Mayor Nancy Clutts, will include James Stanfield of Lakeland Electric; former state Rep. Jerry Paul, now managing member of Capitol Energy, LLC; Susan Glickman of the Natural Resources Defense Council; Mike Antheil, Executive Director, Florida Alliance for Renewable Energy; Metroplan Orlando Director Harold Barley and Rep. Rick Kriseman, D-St. Petersburg. The league will adopt its legislative agenda on Friday. By Dave Hodges, Democrat Business Editor, November 6, 2009 — A panel of 22 company owners from around Florida offered their thoughts Thursday on the state's efforts to help its 1.9 million small businesses achieve success and boost Florida's economy. The event was the 2009 Florida Small Business Summit at the Capitol. The companies, invited by Gov. Charlie Crist, got a chance to hear first hand what state agencies are doing to cut red tape, streamline procedures and reduce burdensome business regulation. Keyna Cory, vice chairwoman of the Small Business Regulatory Advisory Council, spoke on some of the challenges that Florida small businesses face. The council's job is to identify ways to lessen the detrimental impact of proposed state agency rules or programs on businesses. "We need your help. We need everybody in this room's help," said Cory, who is president of Public Affairs Consultants Inc. She encouraged the owners when they return home to let their local civic and business organizations know about the council's efforts and to speak up if they are having problems. In the discussion that followed, Paresh Patel, chairman of the Clearwater firm Homeowners Choice Inc., said a problem he and others face is the rules keeping changing in Florida. Bill James, president of C&C International Computers and Consultants Inc. in Fort Lauderdale, agreed. "I have been doing business with the state of Florida for over 10 years," James said, but in the last year he hasn't. He quoted a conversation he'd had with Linda H. South, secretary of the Department of Management Services, the state's procurement agency, in which he was told " 'it was going to cost too much money to do business with small business,' and I don't understand," James said. "You are changing the playing field." Moderator Dale Brill, director of the Governor's Office of Tourism, Trade and Economic Development, called James's remark "the first no-holds-barred comment coming out of the gate." He added that state government must avoid being inconsistent and creating complexity that complicates things for the survival of small businesses. Contacted later, DMS spokeswoman Linda McDonald said the department relies heavily on small business, particularly minority-owned firms. DMS spent $24.5 million of its own budget in 2007-08 on goods and services from those companies and Florida government as a whole spent $2.95 billion. Secretary South, she added, "is passionate about small business and is a former small business owner herself." By John Booth, Waste & Recycling News, September 14, 2009 — In June 2008, Florida aimed high, establishing a statewide recycling goal of 75% by the year 2020, and setting a Jan. 1, 2010, deadline for the state’s Department of Environmental Protection to come up with a plan for reaching it. But even as that deadline draws near, economic uncertainties and debates over key proposals make it tough to tell what the final plan will look like. It may also take some rethinking of how the state looks at what is considered recycling. For instance, as of 2007 (the most recent year for which data is available), about 12% of Florida’s solid waste was burned in waste and energy plants. Henricks noted that under a new system of measuring recycling, waste burned for energy and landfill gases used to produce electricity will be considered toward the recycling goal, though it’s unclear exactly how. On a more easily measurable front, Florida’s 2007 recycling rate was 28%. And since half the state’s municipal solid waste stream is comprised of paper (25%) and construction and demolition debris (25%), the DEP’s preliminary recommendations — shared most recently at an Aug. 4 public hearing in Orlando — include big steps in addressing those areas. One idea calls for requiring all construction and demolition waste to be processed at a material recovery facility prior to disposal, separating the recyclable material from the nonrecyclable. No other states have such a policy in place. Most of Florida’s material recovery facilities can be found in southern Florida, where disposal costs are much higher, and mandating upfront processing would mean more facilities would have to be built throughout the state, Henricks said. And while waste paper already has a fairly high recycling rate in Florida (40% to 45%), the DEP said that mandating commercial paper recycling in the state’s most populous cities and counties would raise that significantly. But plans and programs need money, and that’s where things get foggy: The Florida state legislature, already facing another tight fiscal session in 2010, has final say over the DEP’s proposals, and new funding may be hard to come by. In hopes of raising money to fund the recycling push, the DEP’s preliminary recommendations include a deposit-collecting bottle bill similar to those in other states, and a $1 per ton landfill disposal surcharge. Henricks estimates the former could bring in $35 million to $40 million annually, while the latter could generate about $17 million per year. But they also face stiff opposition from a big player in Florida business. Keyna Cory, chief lobbyist for Associated Industries of Florida, said that while the business advocacy group supports efforts to improve recycling, AIF has concerns with the process and several DEP proposals. For starters, she said, the 75% number “was pulled out of the air” with no consideration of its feasibility or impact. While DEP recommendations do call for an update to the Florida Recycling Economic Information Study done in 2000, Cory said that’s where the project should have begun. September 2, 2009: AARP Florida is teaming up with American Eldercare to find more state dollars for programs that keep seniors out of nursing homes. 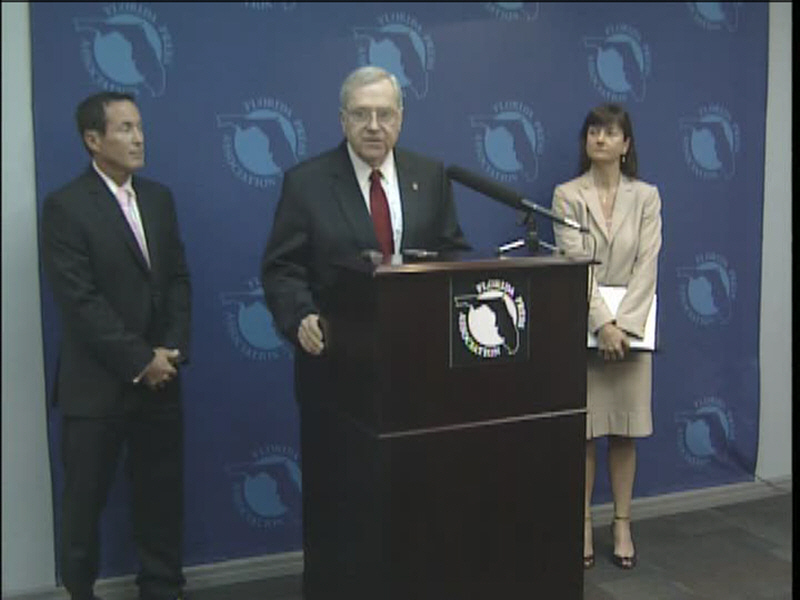 The groups conducted a poll showing seven out of 10 Florida voters support the Nursing Home Diversion Program. Robert Schemel, President of American Eldercare, says the program is cheaper than sending patients to a nursing home. “This is approximately 1/3 the cost of keeping someone in a nursing home. It crosses all lines, Democrats, Republicans, male, female, all age groups. A very high percentage would really rather see people have a choice and stay in their homes rather than the elderly be forced to stay in a nursing home,” said Schemel. American Eldercare is Florida largest contractor for the Nursing Home Diversion Program. The company helps 15,000 Floridians remain in their homes. WJHG TV in Panama City, September 2, 2009: AARP Florida is teaming up with American Eldercare to find more state dollars for programs that keep seniors out of nursing homes. The groups conducted a poll showing seven out of 10 Florida voters support the Nursing Home Diversion Program. Robert Schemel, President of American Eldercare, says the program is cheaper than sending patients to a nursing home. American Eldercare is Florida largest contractor for the Nursing Home Diversion Program. The company helps 15-thousand Floridians remain in their homes. STATE CAPITOL BRIEFS – WEDNESDAY, SEPTEMBER 2, 2009: Citing the results of a recent Associated Industries of Florida poll showing 70 percent approval, advocates for nursing home diversion programs on Wednesday called on state lawmakers to expand programs aimed at providing at-home services and community based to elderly residents who would otherwise end up in nursing homes. "This lends further credence to AARP's studies that show an overwhelming percentage of Floridians believe it is vitally important to be able to choose how and where to obtain long-term care services," said Leslie Spencer, AARP Florida's associate state director. According to AARP, Florida ranks 45th in per capita spending on community based care. Joining Spencer was Robert Schemel, president of American Eldercare Inc, the nation's largest contractor for nursing home diversion services. September 2, 2009: (TALLAHASSEE, FL) – The AARP Florida and American Eldercare, Inc. today announced a recent poll showing overwhelming support in fully funding the Nursing Home Diversion Program and other home and community‐based programs. Click here to read the press release. By Jim Ash, Florida Capital Bureau Chief, Tallahassee.com, April 27, 2009 — Capitalizing on a worldwide recession and fresh memories of $4-a-gallon gas, conservative Republicans in the Florida House have outmaneuvered a formidable enemy in their quest for the industrial Holy Grail — offshore drilling for oil and natural gas. "The stars and the moon have lined up for us," said Keyna Cory, President of Public Affairs Inc. a Tallahassee based Lobbying firm and Chief Lobbyist for Associated Industries of Florida (AIF). "Timing is everything." Rep. Dean Cannon, a Republican from Winter Park and the speaker designate, stunned environmentalists last week by ramming a bill through the House Policy Council that would give the governor and Cabinet the power to approve drilling as close as three miles from shore. The 20-page amendment came out of nowhere in the final days of a chaotic session when all eyes were riveted on a standoff over fixing a $6 billion budget shortfall. Environmentalists were scrambling to save Florida Forever, the $350 million a year environmental land buying program, that is being threatened by budget cuts. With a little less than an hour's discussion, and a quick, mostly party-line vote, every conservationist's worst nightmare was headed for the House floor. The House gave preliminary approval on Friday. "This is like a Carl Hiaasen novel," laments Janet Bowman, a lobbyist for the Nature Conservancy. But unlike the colorful characters who scheme to sell out Florida's natural wonders in Hiaasen's works of fiction, the supporters are very real. Their ranks also include some respected names, including Martha Barnett, a former president of the American Bar Association. Former House Speaker John Thrasher, a lobbyist who is also pushing the measure, smiles broadly and praises Cannon's master stroke. "He's a rising star," Thrasher said. "We needed to look at this, not just pull it out and have everyone just say no. It's been amazing to see the pent-up energy for this." Supporters have been preparing for years. AIF, the largest business lobby in Florida, has been demanding candidates' positions on offshore drilling before approving endorsements since Barney Bishop became its president in 2006. Rep. Dave Murzin, a Republican from Pensacola who voted for the measure in committee, asked his constituents about oil drilling in February. Of the 1,965 who responded, 66 percent supported it, 34 percent didn't. He surveyed about natural-gas drilling in 2006, and it was favored 80 percent to 20 percent. "Sure, I voted for it," Murzin said. "My constituents support it." In the only committee stop, sponsors lined up a respected Orlando economist who promised $31 billion in state revenues over the next 20 years and 17,000 to 20,000 jobs. They came armed with fresh Mason-Dixon numbers that showed broad support. The icing on the cake was a provision that would divert more than $350 million in state drilling royalties to Florida Forever and beach renourishment programs. Later the same day at a reception for lawmakers, Gov. Charlie Crist called the idea "intriguing." Environmentalists were livid, and painted into a political corner. Not only were they forced to oppose a potential new revenue stream for Florida Forever, they faced the prospect of going up against a governor they have lavishly praised in the past for his support of renewable energy and his high-profile fight against global warming. The measure's chances in the Senate, where there is no sponsor, remained unclear. Former Senate President Jim King, R-Jacksonville, is sponsoring the governor's renewable energy package, and expressed an interest in adding the drilling measure. Senate Democratic Leader Al Lawson of Tallahassee said that no matter how badly the state was hurt by the budget crisis, policy makers shouldn't take the bait. "They're using us at a time when we are vulnerable," he said. "They're really trying to catch us when we're down." Late last week, when budget negotiations with the House seemed hopelessly stalled, Senate budget chief JD Alexander said the drilling bill had seeped into closed-door budget negotiations. He suggested that one reason the House may be pushing for it is because the oil revenues would start flowing just when Cannon takes up the speaker's gavel. Cannon denied that the House had linked drilling to a budget deal. "Absolutely not," he said. Thrasher said he wasn't worried that there was so little time left in the session. "A week can be a lifetime in this process," he said. "I know it would pass if I was still in charge." By Louis Cooper, Pensacola News Journal, August 25, 2009: Santa Rosa County residents aren't going to be writing checks to the Emerald Coast Utilities Authority for garbage service anytime soon. ECUA — a governmental entity that provides solid- waste, water and other utility services to much of Escambia County — asked the Santa Rosa County Commission to be allowed to compete with the private garbage services that operate in Santa Rosa. The commission discussed the proposal at a workshop Monday. Bobby Carnley, who has operated North Santa Rosa Sanitation since 1989, told commissioners this morning that he worries about ECUA's ability to use its Escambia services to subsidize and possibly undercut private companies. "We feel a little threatened," Carnley said. "Haulers like me are just in the waste hauling business. I work strictly on the cash flow of my company." Keyna Cory, a representative of the Florida chapter of the National Solid Waste Management Association, also objected. "It is unfair to have to compete with a public entity," said Cory, whose office is in Tallahassee. "Bringing in a government entity will put some of (the private haulers) out of business." No one from ECUA spoke at the meeting, and no commissioner expressed support for the idea. "Let's keep our local haulers busy," Commissioner Bob Cole said. "It's certainly not any time to put more competition on them." Contacted later, Steve Sorrell, ECUA executive director, said the expansion likely would have started in some of the larger subdivisions in south Santa Rosa and expanded. "We felt we could provide that service, and include recycling, for less than the people are paying over there now," Sorrell said. "We don't want to infringe on Santa Rosa County in any way, but if they would like for us to provide that service, we'd be glad to do it." By Alex Leary, Times/Herald Tallahassee Bureau Friday, April 10, 2009 TALLAHASSEE — Cory Offutt walked into the voting booth thinking he was giving himself a property tax break. "It was awesome," the marine towing operator in Miami said of a so-called working waterfront proposal that passed with 71 percent of the vote statewide in November. Amendment 6, as it turns out, does not help Biscayne Towing and Salvage or other businesses like it because of the limited definition of working waterfront that voters approved. But as the Legislature drafts the implementing language — the exact wording that goes into law taking effect in 2010 — a little-noticed but persistent lobbying effort is under way to expand its reach. "Look at this," said Democratic Rep. Luis Garcia of Miami Beach, poking his finger into a photo of a tug pulling a cargo container up the Miami River. "That's a working waterfront to a T." Whatever happens, this much is clear: Sizable property tax relief remains frustratingly elusive for many businesses, even as values have come down in a cooler market. The recent tax cuts offered by the Legislature and Gov. Charlie Crist have been mostly directed to homestead property owners, a large voting bloc but also the group that has been most protected from spikes. Sharply dropping revenue at the state and local level has suppressed the appetite for more cuts. Several property tax bills, some geared toward nonhomestead property including a 5 percent cap on annual assessments, have been stalled or face uncertain fates. So the Amendment 6 implementing language has become a hot target. "I keep having people stop me in the hall and say, 'Is there any way you can help?' “said Keyna Cory, a business lobbyist ( Chief Lobbyist for Associated Industries of Florida, AIF and President of Public Affairs Consultants. Inc.) who was instrumental in getting the amendment on the ballot. "People are still hurting," Cory said. "They are looking for any way to lower the cost of doing business so they can hang on." Sympathy has its limits. Cory and the bill's sponsors — Rep. Julio Robaina, R-Miami, and Sen. Charlie Dean, R-Inverness — say the definition cannot be broadened because nearly 5 million voters have already altered the Florida Constitution. "We'd like to help a lot more, but the way this was drawn, we have to keep it in those parameters," said Robaina, who heralds the bill as the "only real property tax relief Floridians can count on this session. Amendment 6 is an attempt to curtail the long-standing assessment practice that values property at its "highest and best" use rather than its "current" use. Highest and best has been blamed for soaring tax bills for small businesses, some of which succumb to pressure and sell their land. A powerful business coalition, Save Our Waterfronts, worked on a proposal for a couple of years before persuading the Taxation and Budget Reform Commission, a state panel that meets every 20 years, to put it on the ballot last November. The final working waterfront definition was limited to include publicly accessible marinas, waterfront marine-manufacturing facilities and commercial fishing businesses. An estimate showed it could save up to $144 million over three years, taking that much from local government coffers at the same time. Including small hotels and motels and restaurants would have only deepened the hit and made it politically difficult to get approval from the reform commission. Detractors also argue that it is not essential for hotels and restaurants to be on the water, unlike, say, a marina. A bill approved last year provided broader limits on the use of "highest and best" but is not as strong as the constitutional amendment. Advocates for hotels and restaurants have eyed the working waterfront language, too, but not as aggressively as the Miami River group. To exclude tug operators and cargo terminals "just defies logic," said Fran Bohnsack, executive director of the Miami River Marine Group. She accuses the coalition of being unnecessarily rigid and says the amendment language could easily accommodate more business types. The bill could add in commercial transportation facilities of goods and people and the towing, storage and salvage businesses that support them, Bohnsack said. "I'm not requesting something overwhelming," she added. Bohnsack has made scores of phone calls, traveled to Tallahassee twice and even driven to a Lincoln Day dinner in Bradenton to get a few minutes with Republican Sen. Mike Bennett, who was involved with an early version of the bill. The unwanted feeling along the Miami River is just part of a deeper struggle against a changing waterfront complexion in Miami. Bohnsack's coalition has been battling the Miami City Commission over zoning changes that have stripped protections for marine industries based along the river in favor of residential use. The condos have already started to encroach. Offutt, the towing operator, thinks they are to blame for his property tax going from $5,400 in 2006 to about $8,000 in 2008. "It's just the beginning. It shows what's happening to the property values. The more condos that are developed, the higher the tax will become," he said. "I voted for Amendment 6 because I thought it included me. But now I see it doesn't. I feel we've been duped." So far it does not look good for him in Tallahassee, but the river group is not giving up. "The fat lady isn't even humming yet," said Bob Levy, a lobbyist Bohnsack has hired. "There are three weeks left in the session; we have plenty of time." Provides for assessment based upon use of land used predominantly for commercial fishing purposes; land used for vessel launches into waters that are navigable and accessible to the public; marinas and drystacks that are open to the public; and water-dependent marine manufacturing facilities, commercial fishing facilities, and marine vessel construction and repair facilities and their support activities, subject to conditions, limitations, and reasonable definitions specified by general law. STATE CAPITOL BRIEFS - March 31, 2009 A Senate committee postponed a bill – likely until next year - that would have ended the requirement that local governments post public notices in newspapers, despite the assertion by the bill's sponsor that newspapers are becoming obsolete. Sen. Ronda Storms, R-Tampa, read off a list of statistics on the declining number of people who depend on newspapers to get their news and said it doesn't make sense to continue requiring public notices to be placed in them because of the high cost to cities and counties, which are pushing the bill (SB 2292). Opponents of the measure include, no surprise, newspapers, but also a number of advocacy groups like AARP and the NAACP, who argue that people who don't have access to the Internet won't be informed by their government, which means the elderly, and large numbers of minorities would be disenfranchised. But the chairman of the Senate Community Affairs Committee, Sen. Mike Bennett, R-Bradenton, said he didn't trust the government not to shut down electronic media and announced that the bill would be postponed for staff to study the issue over the summer. By Mary Ellen Klas, Miami Herald Blog & St. Petersburg Times Blog, March 31, 2009: A bill that would remove the requirement that local governments publish their official notices in printed newspapers was halted by the Senate Community Affairs Committee on Tuesday when the chairman, Sen. Mike Bennett, said he was ordering a staff study over the summer instead. By contrast, killing the bill was the top priority of the Florida Press Association, and was opposed by AARP and Associated Industries of Florida. Storms predicted that the death of printed newspapers in Florida was inevitable. "Members of the media may not want to acknowledge it but, in our lifetime, it's going to take care of itself,'' she said. "All we're doing is propping up the media. I think that print media is going to go away." Bennett replied: "I look at the whole idea of a no printed media as terrifying. I realize the federal government can shut down a satellite and we lose all our unprinted media. Maybe you have more faith in Government than I do." Florida's faltering newspaper industry got a rare dose of good news today: the state Senate killed a measure that would have eliminated a reliable revenue source, government legal ads. Sen. Ronda Storms, R-Tampa, had sponsored a bill to allow counties and municipalities to post public notices for meetings and legal advertisements like foreclosure notices online. Under current law, local governments must pay to place such notices in general circulation, English-language newspapers. Storms said the newspaper industry is dying, anyway, and this would allow local government to save money. "We read all about the trouble in the newspaper industry," Storms said in the Senate Community Affairs Committee. "There are newspapers in the country that shut down print - that are solely reliant online. Many in the media think newspapers are anachronistic and they're going to be passing in our lifetimes." But with the bill hotly opposed by a coalition claiming that online-only public notices would disenfranchise those without Internet access, committee chairman Sen. Mike Bennett delayed the measure until next year. "I look at the whole idea of losing the printed media as terrifying," said Bennett, R-Bradenton, who said the Senate would study the idea over the summer and bring it back next year. Indeed, the newspaper industry is struggling, due to the migration of readers (especially young readers) to the Internet and the recession that has worsened declines in key advertising sectors, like automobiles and real estate. Newspapers are shedding staff. A few, including the Rocky Mountain News and the Seattle Post-Intelligencer, have stopped printing altogether. Storms' bill would have allowed people to receive meeting notices and legal ads through e-mail. Those without Internet access could sign up to receive notices through regular mail. The measure was a favorite among cash-strapped city and county governments, which spend millions advertising their meetings in newspapers. "They love, love, love this bill," Storms said. "They may spend $50,000 on a public notice and nobody comes - zero, nada. Nobody shows. The vast majority, they just don't care." Storms cited studies showing a majority of people read their news online and many would not mind much if their local newspaper went under. Only the 65-and-older age bracket has an affinity for the printed word, she said. "We're seeing it in a tailspin right now," she said. "I'm sorry to be the bearer of bad news. I'm just reading the headlines of their own newspapers." But former Fort Lauderdale Sen. Matt Meadows, representing the Save the Public Notice Coalition, said posting public information online-only would disenfranchise older and minority populations that have lower Internet access rates. The group would support posting public notices both on the Internet and in the newspaper, he added. "We feel it's better to have more transparency," he said. By MICHAEL PELTIER THE NEWS SERVICE OF FLORIDA THE CAPITAL, TALLAHASSEE, March 10, 2009… A handful of proposed constitutional amendments to limit local government’s ability to tax have caused a lot of sound and fury but may end up signifying nothing, at least this year, a key Senate Republican said Tuesday. Speaking to reporters after the Senate Community Affairs Committee passed a resolution (SJR 1906) to cap local property tax increases, chairman Mike Bennett said that proposal will likely be reduced to a study by the time lawmakers are through with it. Likewise, Bennett said his own measure (SJR 738) to place an overall cap on local taxes might also be relegated to the food-for-thought file by the time lawmakers adjourn six weeks from now. “I think both of these bills, at the end of the day, will be some kind of study over the summer to find something (for next year,)” said Bennett, R-Bradenton. Bennett’s comments came after the proposal to ask voters to tie local property tax increases to inflation plus population growth was approved 6-4 by the panel, over the objections of firefighters and representatives from cities, counties, school districts, and unions. Critics contend the proposal, sponsored by Sen. Mike Haridopolos, R-Melbourne, closely resembles the Taxpayer Bill of Rights, or TABOR legislation they say has been unsuccessful elsewhere and that it would hamstring local government when providing critical services. And if local governments fail to provide necessary services, state taxpayers will be left holding the bag. “If a local government fails because of your actions, you will be running it from here. You Break you Own it.” said Jack Cory, who spoke against the measure on behalf of juvenile justice and elder services providers. The 6-4 vote got the measure out of its first committee in what backers admit will be a difficult road that includes four more committee stops in the Senate alone. And as a proposed constitutional amendment the measure, if passed, would then go before voters. If the Haridopolos amendment were added to the constitution, local and state revenues could not increase faster than inflation and population growth unless a majority of local voters approve. New taxes would have to be approved by two-thirds of voters. A similar proposal was rejected last year by a panel assembled to revamp the state’s tax structure. “There is nothing more important the Legislature can do to bring business to this state and grow our native small businesses than get control of state and local government spending,” said Allen Douglas, Florida legislative director for the National Federation of Independent Business. Bennett’s plan (SJR 738) limits total property tax for schools and local governments to 1.35 percent, or 13.5 mills. The House Military and Local Affairs Policy Committee is scheduled to take up an identical measure (HJR 385) on Wednesday. Rep. David Rivera, R-Miami, is the House sponsor. In 2007, the Florida Supreme Court threw out a similar constitutional proposal, saying the ballot summary was misleading because it didn’t say where excess money would go. Coupled with the troubled state of local financing, the timing may not be right for further restrictions on local spending. But even if they don’t pass, Bennett said the measures are focusing legislative attention on the property tax issue, where they can return once the economy turns around. “Sometimes these things take three or four years to come to fruition,” Bennett said. By JENNIFER RICH and BRIAN NEILL Manatee/Sarasota Herald Staff Writers — Tax incentives and tax breaks, reducing health care costs, stopping the rise of workers compensation insurance. These topics are on the minds of small-business owners as they watch the opening today of the 2009 state legislative session. With fewer customers and declining revenues, business owners hope legislators can provide some help while they still cut billions from the budget deficit. State economists Monday said Florida’s economic outlook is getting worse due to the “double-whammy” of the national recession on top of the state’s housing slump. That’s only going to make a bad budget situation worse for Florida lawmakers as they begin their annual 60-day session. Economists are predicting that it now looks like the national recession is going to last through the end of this summer, a quarter longer than previously forecast. Florida’s economy, though, is expected to remain flat for another year after that because it was affected more than the nation as a whole by the housing decline. Dennis Cathcart, owner of Tropiflora wholesale and retail nursery on Tallevast Road, hopes the Legislature will consider giving tax credits to employers like him who have not laid off any of his 18 employees despite a slower economy. He has had to ask employees to take volunteer furloughs of a day or two to keep up with expenses. “We are selling a nonessential product, so anytime there is a ripple in the economy, we feel it,” he said. Cathcart believes his company’s other contributions include providing 60 percent of employees’ medical coverage and generating oversea dollars through exporting. It would be nice if those in Tallahassee recognized those efforts through tax breaks or incentives, he said. Ashok Sawe, owner of Palm Tree Villas on Anna Maria Island, is hoping the Legislature will do whatever they can to increase or maintain the level of tourism in the state. Sawe is upset at the idea of an additional one-cent bed tax being proposed by the Manatee County Tourist and Development Council, afraid it will act as a further deterrent to out-of-state visitors. A sales tax exemption might be the boost everyone needs, Sawe said. The state would lose the sales tax revenue, but if every tourist dollar contributes $4 or $5 to the local economy, you could protect that revenue with a tax exemption, he reasoned. “We get a lot of European visitors who say they are struggling with the exchange rate and air fares and a sales tax exemption would help,” Sawe added. Keyna Cory, chief lobbyist for the Associated Industries of Florida, which was sponsoring its annual pre- legislative event for lawmakers and the press Monday, said the business group’s top priorities are clearing up the language in the workers’ compensation law that will cap attorney fees and streamlining the per- mitting process required be- tween state and local agencies. “If workman’s comp isn’t fixed, you can expect to see rates jump at least by 15 percent,” she said. Cory said she has heard “horror stories” from business owners from farmers to developers on getting permits to do business. “Forms don’t match up; the process needs to be streamlined with less duplication,” Cory said. She is worried that providing a sales tax exemption right now would not be helpful to a state facing billions in a budget shortfall. “So we are not asking for any sales tax incentives right now,” she said. Cory is impressed with the legislative delegation representing Manatee and Sarasota counties and gives them high marks in working with business interests. Manatee Chamber of Commerce representatives will be going to Tallahassee March 18-20 to meet with key legislators to push their agenda of changes in education, transportation, economic development and health care. Health care changes are the No. 1 priority, said Neil Spirtas, vice president of Public Policy & Small Business. They include providing sovereign immunity for physicians taking emergency-care calls, raising reimbursement rates for Medicare, and providing affordable health care for business owners through small group plans. State Rep. Ron Reagan, R-Bradenton, said he and fellow legislators are still trying to digest all of the provisions in the federal stimulus bill. “Once we kind of know more what the federal stimulus package is going to be it will lead us into what we need to do,” Reagan said. Reagan said he would be open to looking at reducing sales tax exemptions for things like bottled water and skybox tickets to athletic events to help bolster the state’s coffers. “I know for a fact that we’ve been looking at the sales tax exemptions. I’m willing to look at anything,” Reagan said. State Rep. Keith Fitzgerald, D-Sarasota, believes the state will benefit greatly from the federal stimulus funds heading its way. “The first thing we have to do is draw down the federal recovery act money because there are a lot of things in there that will put people to work,” Fitzgerald said. Fitzgerald said he is also sponsoring a bill to provide subsidies to businesses that generate renewable energy. “I’m sure there are many other ideas out there like that,” he said. State Rep. Bill Galvano, R-Bradenton, said the economic turmoil has brought about a defining moment in Florida’s history. “I think the difficult economic times that we are experiencing right now are providing us the greatest opportunity we’ve ever had to reevaluate how we treat businesses in the state of Florida,” Galvano said. Galvano said he wasn’t opposed to looking at issues such as sales tax exemptions, but doesn’t believe that focusing on taxes is the answer. “I firmly believe we’re not going to tax ourselves out of the economic conditions we’re in currently,” Galvano said. That said, Galvano acknowledges that solving the problems of economics and business in the state is not going to be easy. “It’s the most challenging session we’ve had in many decades, and even former members who were around in the seventies and earlier would agree with that,” Galvano said. By Dong-Phuong Nguyen, Times Staff Writer, October 3, 2008 TAMPA — More than a year ago, state Rep. Baxter Troutman was faced with a $5,200 repair bill when thieves tore apart the irrigation system for his citrus farm to steal copper wiring. Troutman soon learned that he was not alone. The theft of metals for money was such a lucrative business, cases were popping up all over the state. The Republican from Winter Haven fought back by introducing a bill that makes it harder to sell the metals. That law went into effect Wednesday, bringing great relief to industries hit hard by the thefts, but a headache to scrap metal dealers who now must adhere to a long list of requirements. "We're excited about giving law enforcement more tools and options to hopefully bring a stop or at least put a dent in this epidemic that has spread not only in our state, but I suspect the nation as well," Troutman said. The law calls for buyers to document much more information from sellers than before. It requires facts like full name, address, and home and work phone numbers; vehicle make, model and tag number; and height, weight, gender, eye and hair color. Also, payments above $1,000 must be by check. "It's a nightmare," said Edward Sharpe, vice president of Industrial Metals Recycling in Tampa. "There's just a super amount of information that is required now, and it's just a slow process." Sharpe said that though he supports the new law, the first 24 hours after it went into effect weren't fun. He processed about 200 to 300 transactions in that 24-hour period. What used to take minutes per person is now about 10 to 15 minutes. So far, none of his customers have refused to provide the information, said Sharpe, who once had 12,000 pounds of stainless steel stolen from his business four hours after it was dropped off. "We do not buy stolen material; nor do we encourage it," Sharpe said. "I just need to figure out how to speed up the process to get customers out quicker." Scrap copper, often shipped to China to be recycled, sells for about $2.30 a pound. The damage that thieves do in acquiring the metal far outweighs the money they bring in. Nationwide, the theft of metals has caused more than $1-billion in repairs and replacement for its victims, said Keyna Cory, coordinator for Floridians for Copper and Metal Theft Crime Prevention, a fraud business coalition made up of representatives from a spectrum of companies like utilities, beer distributors and construction. Popular targets are new-home sites, air-conditioning units, beer kegs and farms. In January, thieves broke into a Seminole Heights church, broke up the air-conditioning unit and stripped the wires inside the building — all for $200 worth of copper. The damage they left behind? More than $50,000, Cory said. Cory, who is also chief lobbyist for Associated Industries of Florida, said she sent out an e-mail to business owners statewide this year to see if they had concerns about the theft of copper. "My computer was like a Christmas tree lit up," she said. "Everybody in the world seemed like they were getting hit." Cory said she soon discovered that Troutman's bill was already in the works, making a lot of people happy. "The great thing now is ... thieves are going to think twice about selling it," Cory said. "If they don't have a place to sell their goods, maybe they won't steal property." Dong-Phuong Nguyen can be reached at (813) 269-5312 or nguyen@sptimes.com.